How Much Rebar Is Used in the Construction of a Block Wall? Steel reinforcing bar -- rebar -- is used in concrete construction to add strength. Concrete has great compressive strength, the ability to withstand downward pressure, but very little tensile strength, the ability to withstand bending. Concrete block shares this condition. A concrete block wall will support heavy weights above, but it needs reinforcing against pressure that would cause it to bend, such as earth backfill in a basement. Steel rebar provides this lateral support because it will flex and because steel not only resists bending but will try to return to its original shape if bent. This concrete block wall has wooden house framing attached. Rebar is placed in walls both vertically and horizontally, depending on the type of wall and the forces on it. It typically is installed in a poured concrete footing or base for the concrete block wall, set into the concrete for the depth of the footing and spaced so holes in the blocks will go over the rebar, to be secured with concrete grout. Spacing of rebar will vary with the type of wall and construction. Concrete block can be laid with mortar between blocks or dry-stacked and sealed with a surface bonding cement. Mortared block sometimes is reinforced with horizontal rebar laid in the joints as support against lateral pressure, such as basement backfill. This horizontal spacing will vary, but frequently is about every four courses of block. How much rebar is used in any particular wall will depend on the height, length and use of the wall. A freestanding garden wall or block privacy fence will require less reinforcing than a basement or other load-bearing wall in a house or other building. An 8-foot-high wall will obviously require more rebar than a 4-foot wall. Very short walls, under 4 feet and laid with mortar, may not require any rebar. Typical spacing of rebar in a house wall is one bar at every corner, one on each side of every opening for a door or window and bars 4 feet apart between those bars. A 20-foot-long wall with one door, for instance, probably will require eight or nine sections of rebar, depending on placement of the door. One block supplier recommends 5.3 feet of reinforcing per block length or 7.5 sections for every 100 square feet of wall. Rebar comes in varying lengths, sizes and styles. That installed in house walls is usually 10 to 12 feet long, depending on the depth of footings. 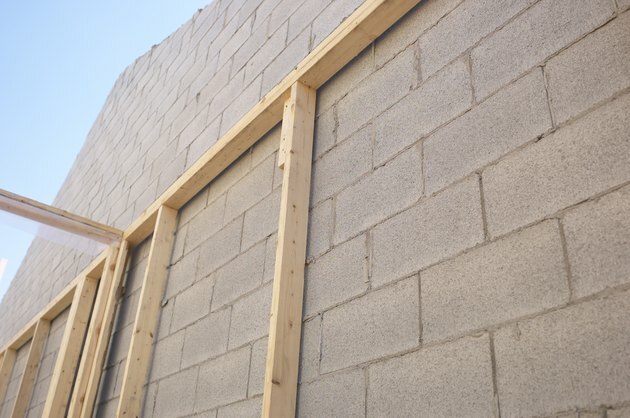 Most house walls use 1/2- or 5/8-inch rebar, but shorter walls and those that are not load-bearing sometimes are built with 3/8-inch; the smaller size is most often used in horizontal applications to match mortar joints. Rebar may be smooth or have ribs to better fasten in mortar; ribbed is most common in home building. Always check local building codes and regulations before building any wall. Many building codes will specify how much rebar is needed for a particular application. House foundations and other walls and freestanding walls over 4 feet high will require building permits. How Deep Should a Concrete Foundation Be?